Fullstack Academy’s flagship program is a full-time accelerated bootcamp for software engineering. Named “Best Coding Bootcamp” in the country by SkilledUp, a leading tech-education publication. Y Combinator backed. 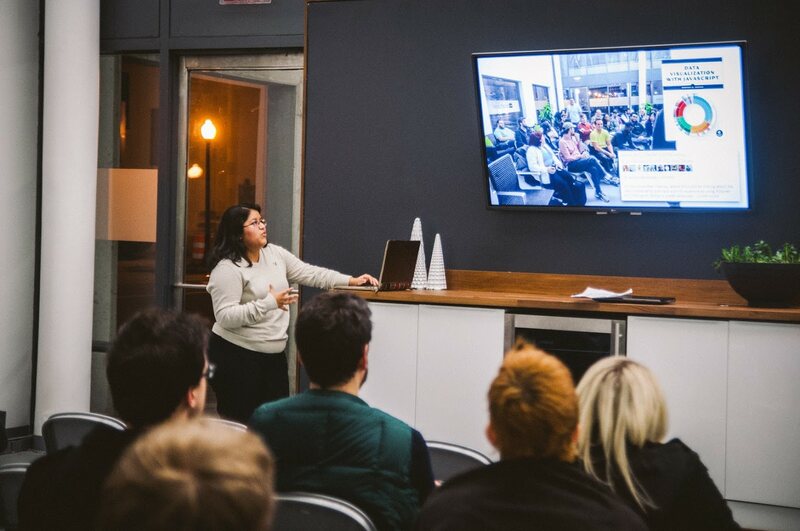 In January 2016, Fullstack Academy launched Grace Hopper Academy, the first all-women coding bootcamp in New York City, and the first in the country to offer a deferred tuition model. 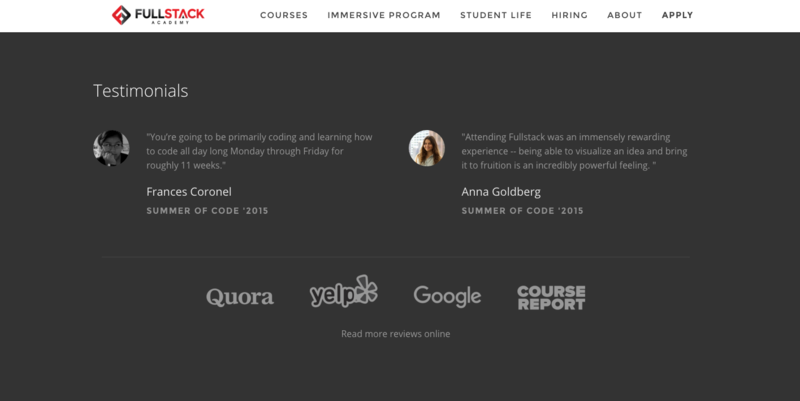 Fullstack Academy’s flagship program is a full-time accelerated bootcamp for software engineering. Named “Best Coding Bootcamp” in the country by SkilledUp, a leading tech-education publication. Y Combinator-backed. In January 2016, Fullstack Academy launched Grace Hopper Academy, the first all-women coding bootcamp in New York City, and the first in the country to offer a deferred tuition model. If you or someone you know is interested in learning more about Fullstack Academy or Grace Hopper Academy and how to best prepare for entering the programs, feel free to look at the “fullstack-me” GitHub repo I created that contains resources on how to best to best prepare and get accepted. Around the winter of 2016, Fullstack was asking for interested alumni to be a part of the ambassador program. The ambassador program involved referring students to the program and then mentoring the accepted students in exchange for a stipend. Through this program, I created a lot of material that I felt would be of help to prospective Fullstack Academy students and was able to guide and mentor a student who got accepted to the new Grace Hopper program. Although I am no longer formally an ambassador, if you’re interested in learning more about Fullstack Academy and how to best prepare for entering the program, feel free to personally reach out to me. I’d be delighted to walk you through the process and provide helpful resources. In the summer of 2015, I graduated from Fullstack Academy’s inaugural Summer of Code cohort. Since then, Fullstack has acquired Startup League in Chicago and introduced The Grace Hopper Program, the first all-women coding bootcamp in New York City. Today, I am a passionate ambassador for all their programs. 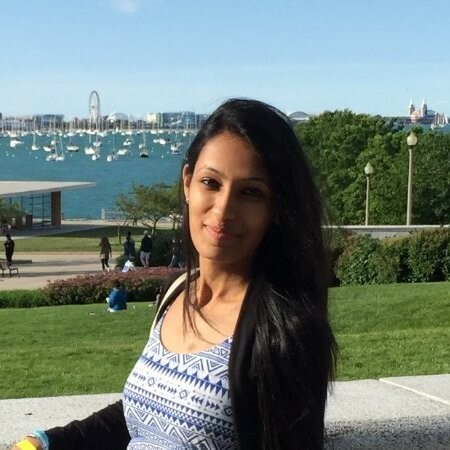 Mentored Kelaiya Parikh for ~6 hours. This was a helpful resource I created that has a lot of job interview resources. Shanna shared this resource with the Career Success team to give to Fullstack job seekers. Don’t just apply to one program! Go ahead and use Course Report to find programs of all kinds and choose the ones that best suit your long-term goals. Avoid being scammed and do your research on the program you want to attend. Read reviews, reach out to alumni who come from a similar work/academic background as you, and look up the program on the news for any red flags. After all, you don’t want to pay all that money for nothing! It’s better to try harder and get into a more competitive program with a lower acceptance rate than settle for one that churns students out. If you’re not familiar with the platform GitHub, now is the time to make yourself extra familiar! Regardless of which program you decide to enroll in, you will be probably end up using GitHub a lot as a developer. Create a profile and spice it up with open-source contributions or personal projects. A great starter project is a simple personal website using GitHub pages. Make sure to market yourself appropriately! Meaning, if you have done something outside of work that can highlighted as a technical achievement (contributed to open-source, completed a lot/all modules on a platform, top student in STEM major, etc. ), make sure to share it online! The only way employers or interviewers can know about how passionate you are about coding is if you share this with them! I would recommend using LinkedIn or your personal website to showcase this kind of information. Don’t think you’re ready to become a developer? Then just start acting like one! Start attending hackathons, tech Meetups, or conferences that are friendly towards newbies. Being able to code is a little different from regular typing, so I’d recommend using a platform like Typing.io to help improve your current typing abilities. Faster and more accurate typing is like a better REPL — not only does this speed up development, it fundamentally affects the exploration process. Similar to the tip above, if you know the way around your dev environment really well, you can get things done a lot faster. If you’re using Sublime Textas your main text editor, I would take a look at Sublime Tutor which is an interactive in-editor keyboard shortcuts tutorial. Are you willing to dedicate 4 months of your time to learning how to code on a professional level? Do your career goals align with the aftermath of this program? How much coding have you learned so far? What have you been using to teach yourself how to code thus far? Have you attended any hackathons, tech Meetups, or conferences related to web development or the tech industry? Are you sharing any technical achievements online? How prepared do you feel for the technical interview? Have you practiced solving problems of any websites? Uploaded by Fullstack Academy on 2017-03-16.